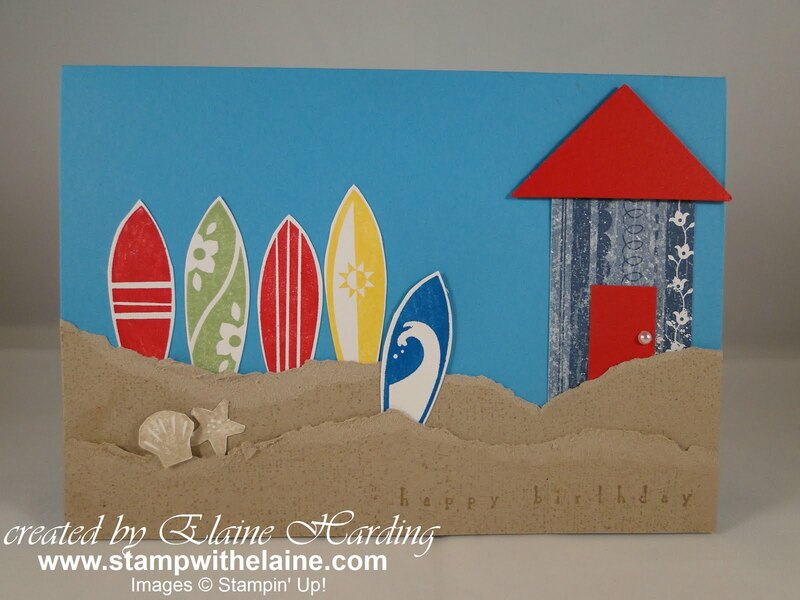 This is my final sample using my favourite surfboard images. I used the Texture jumbo wheel to resemble sand with Crumb Cake on Crumb cake and tore strips and adhered to the Tempting Turquoise base card leaving the top edges free of adhesive so I could tuck in my paper pieces. As the surfboards are all on one stamp, I stamped them in different colours on scraps of Whisper White. I could have used markers to colour them individually, but find that the colours are not as intense when you ink that way. Once you cut all the pieces, you can mix and match them on different cards so the stamped images aren't wasted anyway. The beach hut was cut from Blueberry Crisp DSP and I just cut a punched square of Real Red diagonally for the roof, then added a door, and the seashell and starfish to complete it. When I first acquired this set, I really wasn't sure how to tackle this stamp set - the surfboards were easy but the rest had me flummoxed. I've left out the bucket and spade image in my set of 4 but it can be seen here.